Sausalito is a city in Marin County, California. The population was 7,061 as of the 2010 census. 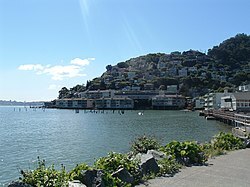 Sausalito is about 8 miles (13 km) south-southeast of San Rafael, 4 miles (7 km) north of San Francisco. This page was last changed on 6 July 2018, at 19:02.